Advanced economies in the 21st century are caught between two giant, competing truths: economic growth is slowing down, and science is flourishing. 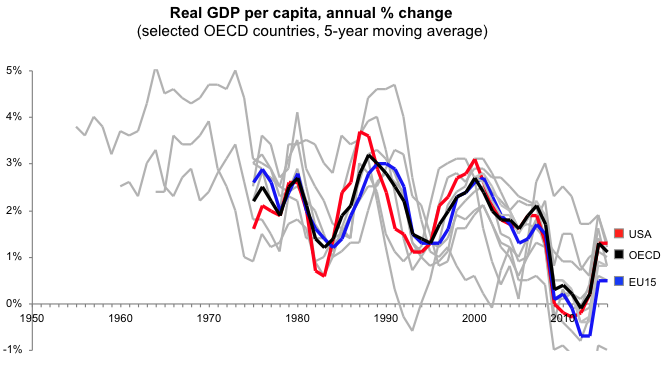 Per-capita GDP growth is trending downward across the OECD (Figure 1). Among other explanations (rising inequality and debt levels, for example), economic theory variously attributes this trend to diminishing returns – from the one-time transition of women into the labour force (Bloom et al. 2003), from human capital improvements via higher education (Goldin and Katz 1998), or from the exploitation of natural capital (Costanza et al. 1997). Recently, Robert Gordon (2012) highlighted another site of diminishing returns, namely, technological innovation. Via a longitudinal study of US labour productivity from the 19th century to the 21st, he showed that the advent of computing and digital communications, for all their seemingly transformational impact upon society, haven’t generated much economic growth when set in historical terms. The innovations to which the generations at the beginning of his study bore witness (public sanitation, electricity and combustion engines) drove rapid US labour productivity improvements for 80 years. Computers and information technologies, however, drove equivalent rates of improvement for only ten years. Average US wages rose 350% in the 40 years between 1932 and 1972, but only 22% over the next 40 years. The pattern holds similar across the developed world. In other words, for all their hype, the computer and the internet have done less to lift economic growth than the flush toilet. The implication is that the truly transformational innovations may already be behind us. Before, we couldn’t harness electricity – now we can. We couldn’t maintain sanitary living conditions – now we can. We couldn’t get from any A to any B – now we can. We couldn’t talk to anyone anywhere anytime – now we can. Whatever’s left – driverless cars, or even quantum teleportation – might prove incremental in comparison. This line of argument imagines technological innovation to be like pulling balls from an urn, each ball representing a new idea. In the beginning, the urn was full and the spheres were large, but each time we’ve gone back to the urn, we’ve had to reach deeper than the last, and the spheres have dwindled into marbles. In a new book, we argue that this metaphor, while intuitive and compelling, is backwards (Goldin and Kutarna 2016). Innovation is more like mixing compounds in an alchemist’s lab. Each compound is an existing idea or technology, and in the beginning we had just a few – maybe some salt, sugar, and common liquids. But then we tried mixing them together, and some of them reacted with one another to form new compounds. Before long, our once-sparse workbench was crowded with acids, alcohols, and powders. Every time we enter the lab to cook up something new, we are confronted by a wider range of compounds than the last. We need never fear running out of powerful new combinations to try. The fear, rather, is that new compounds and their possible combinations are multiplying so fast that we may fail to find the most useful reactions that lie buried among them. This metaphor is far closer to the present experience in research laboratories. Across the sciences, the pace of discovery is generally rising, not falling. For reliable evidence, consider the pharmaceuticals industry (a good litmus test because it invests more into R&D than any other industry, except aerospace). The year 2013 set a new record for total drugs launched world-wide (48) – a record that was promptly beaten in 2014 (61). With another 46 drugs launched in 2015, the last three years have been the industry’s three most productive in its history. Recent major discoveries include new weapons against heart failure, which in an aging world is now the leading cause of death; immunotherapies, which help to defeat cancers by boosting the body’s own immune response; and a viable pathway to effective Alzheimer’s medications within a decade. In part thanks to the accelerating pace of pharmaceutical achievements like these, average life expectancy across advanced economies is now rising an unprecedented four to five hours per day. Of course, for a hardened growth sceptic, such evidence may do little to overturn the broader thesis that returns to technological innovation are diminishing (indeed, it may strengthen that thesis, since one of the consequences of a ballooning population of healthy retirees, ceteris paribus, would be deteriorating output per capita). From an economics standpoint, the transforming pharmaceutical breakthrough was the invention of a pharmaceuticals industry – drug discoveries made and distributed within that paradigm, no matter how important or frequent, are all incremental gains by definition. However, what if the whole paradigm were to shift? ‘Paradigm shifts’, in the sense that Kuhn (1962) described in his Structure of Scientific Revolutions, re-introduce the possibility of transformational change, by shifting scientific endeavour out of theoretical frameworks whose limits are being approached and into new ones whose limits have not yet been explored. The classic example is the Copernican Revolution, which by challenging medieval theories of motion ultimately gave birth to the Newtonian physics upon which most modern machines are now based. Such paradigm shifts are underway right now, and will undoubtedly disrupt and reconfigure advanced societies over the next 30 to 50 years. Medical science is not merely discovering new drugs. The advent of synthetic biology – the capacity to design and modify organisms at the genetic level – promises to eventually shift the societal role of medicine from the treatment paradigm that has prevailed for 5,000 years to one of transforming organisms to give them overwhelming natural advantages against disease and aging. Within this new paradigm lifespan, intelligence, and other basic human characteristics may quickly evolve beyond ranges that we consider normal today. As they develop, such medical technologies will also raise the most difficult ethical questions that science has ever presented society – what about us makes us human? Should (and can) humans and trans-humans coexist? Another source of societal disruption will be artificial intelligence, which is rapidly shifting the role of computers from being tools for calculation to tools for cognition. This shift has near-term implications for the structure of the labour market (according to the Oxford Martin School, almost half of all current jobs in the US have a high likelihood of being automated away by 2050; see Frey and Osborne 2013), but the more profound disruption will be to prevailing conceptions of free will. Many of the choices we take for granted in our daily lives today – which routes we drive, what products we purchase, what media we consume – will rapidly become subject to AI scrutiny that will unveil a range of individual and social consequences to which we are presently ignorant. As this new cognitive layer over collective private action increases in strength and reliability, how will that domain of private action be affected? Will we be permitted to continue socially harmful activities in defiance of such evidence? Will elaborate incentives arise that cause our individual behaviours to conform to optimisation algorithms? And who will hold the authority to set and adjust such algorithms? Similarly, profound transformations to society as we know it now are suggested by present pathways of inquiry into quantum mechanics, nanotechnology, and neuroscience. The proximate cause for these paradigm shifts is digital computers, which can peer more deeply and accurately into data than any prior analogue instrument. Because of their (exponentially increasing) power to crunch giant datasets and discern ‘signals’ from ‘noise’, computers have already done, and will continue to do, more to advance astronomy than the invention of the telescope, more to advance biology than the microscope, and more to advance physics than the particle accelerator (Robertson 1998, 2003). The golden age of labour productivity growth to which Gordon's longitudinal research points – that single lifetime during which planes, automobiles and electricity arrived together to define modernity – was founded upon a relatively simple set of discoveries: abundant oil under the ground, internal combustion engines, germ theory, etc. Now we possess the tools to begin exploring the genuinely hard questions that reality presents. All science today stands near the base of a steep learning curve. The broader cause for these emerging paradigm shifts is the inflation in human brainpower that has taken place over the past 25 years. Thanks to giant medical successes against childhood disease and aging over the past quarter-century, the present global cohort of adults is humanity’s largest and healthiest ever. It is also the best-educated. In just a generation, illiteracy has fallen from nearly half to just one-sixth of humanity. In 30 years, we’ve added three billion literate brains to our ranks. Meanwhile, the rapid expansion of higher learning in Asia means that the number of people alive right now with a university degree is greater than the total number of degrees awarded in history prior to 1980. Most importantly, the present generation is history’s best-connected, thanks principally to a quartet of big events – the end of the Cold War, waves of democratisation across Latin America, much of Asia and sub-Saharan Africa, China’s emergence from autarky, and the advent of digital communications. Neither history, nor the present-day pace of scientific discovery supports the notion of diminishing returns to technological innovation. The challenge for growth economists is that analytic models are poorly suited to capture, and set society’s expectations for, these impending disruptions. Some consequences will be too pervasive and long-term to show up clearly in the immediate data. Some will change our behaviours, and by doing so invalidate prevailing economic assumptions. And some will transcend the economic sphere entirely to touch higher human values. Growth economics is powerful. At its best, it is an empirical science that helps determine how to lift human wellbeing – one of civilisation’s most important tasks. But it is unable to capture the dynamism of our new age of discovery for a reason. Much that matters is still beyond its sight. Bloom, D E, D Canning, and J Sevilla (2003), “The demographic dividend: A new perspective on the economic consequences of population change”, Population Matters, Monograph MR-1274, RAND, Santa Monica . Costanza, R, R d'Arge, R, R de Groot, S Farber, M Grasso, B Hannon, K Limburg, S Naeem, R V O'Neill, J Paruelo, R G Raskin, P Sutton, and M van den Belt (1997), “The value of the world's ecosystem services and natural capital”, Nature, 387(6630), 253-260. Frey, C and M Osborne (2013), "The Future of Employment: How Susceptible Are Jobs to Computerisation? ", Oxford Martin School Programme on the Impacts of Future Technology. Goldin, C, and L F Katz (1998), The Race Between Education and Technology, Cambridge and London: Belknap Press of Harvard University Press. Goldin, I, and C Kutarna (2016), Age of discovery: Navigating the risks and rewards of our New Renaissance, Bloomsbury. Kuhn, T S (1962), The Structure of Scientific Revolutions, (1st ed) Chicago: University of Chicago Press. Robertson, D S (1998), The New Renaissance: Computers and the Next Level of Civilization, Oxford: Oxford University Press.